Apart from one small problem, I’d be quite comfortable with the fact that poker machines are voluntary taxation for stupid people.Â Unfortunately, poker machines are also involuntary taxation for stupid people’s families which is a little harder to be relaxed and comfortable about and people who benefit from poker machine revenue know this quite well. Sure, I get that addiction is addiction, but if you’re going to have a fatal flaw, surely you could come up with something a bit more glamorous than feeding your grocery money into a machine that goes ping in a room full of people wearing trakky dacks?Â I know we’ve all got to get our kicks somehow, but pokies have got to be the world’s most pissweak form of entertainment. If you can’t get a life, get yourself a twitter account instead. You can still wear your trakky dacks, only 95% of your fellow addicts are insane and best of all it’s free. 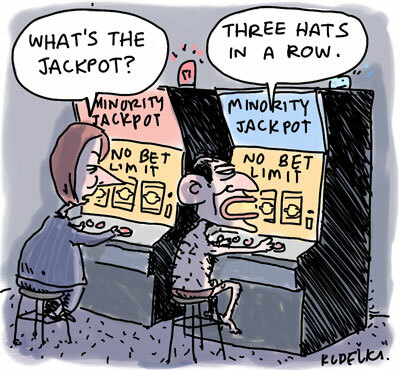 Anyway, good luck Andrew Wilkie, but with politicians you’re dealing with the biggest pokie addicts of all. I completely agree. The SA “Government” is currently negotiating for a neW [and bigger] casino for Adelaide. It is in the web of gambling entrepreneurs, property developers and sports administrators. No wonder it is resisting an anti corruption authority! Other thing Twitter has over pokies for those with no life, is that on Twitter pants (yes, sad to say even trakky dacks) are completely optional. P.S. Adding phrase ‘trakky dacks’ to spell checker’s dictionary sure gives one a sense of pride in Australian English.